Linda attended Palo Verde High School from 1967-1970 where she was on the softball team for one year and the gymnastics team for three. Her greatest athletic success came in bowling where she has been a member of the Women’s International Bowling Congress (WIBC) for more than 29 years and the American Bowling Congress (ABC) for the past 10 years. Until 1994 the ABC was only for men. In 1995 she became the first woman in the U.S. to compete in the ABC National Masters. She has won dozens of awards from the ABC in city doubles scratch, city team and masters scratch. 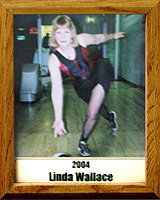 In 1985 she was inducted into the Tucson Bowling Hall of Fame for the WIBC for superior performance, and in 2000 she was inducted into the Arizona Bowling Hall of Fame for Superior Performance. The holder of several all-time records for city tournaments and two national team records, Linda has won 19 WIBC city titles, 16 WIBC state titles and one WIBC national title. She has coached junior bowlers from 1992-1999 as well as the University of Arizona bowling team (1996-97). She is a certified Team USA Bronze Level Coach. Besides participating in bowling for the past 10 years, she has edited a column for the Desert Bowler newspaper. With her husband Eric she authored a book titled “The Zen of Bowling.” Together they also wrote a column to help bowlers with their mental game. Her writings have won her many national awards from different organizations.